This is the entrance to phase 1 of MetroPark. This is the initial phase to built at this development. We have 11 apartments in this phase - each furnished and equipped to our strict specification. Note: The Management have finally - after a lot of pressure - built ramps at the entrance and at each building at MetroPark. When you pass through the entrance - you are greeted by palm trees and a gushing fountain. This foot bridge links the entrance to the swimming pool area. The bridge spans a Klong (Canal) which has recently been planted with Lotus Blossoms. Swimming pool at Phase 1. The swimming pool in Phase 1 is so relaxing. There is also a manned security presence - ensuring your peace of mind. For guests with young children - each swimming pool has a shallow kids area - so no matter how young/small your child is, he or she is safe. This is a view from our apartment on the 8th. floor in phase 1 (note the surrounding jungle). Each apartment has a full complement of fresh bed linens etc. 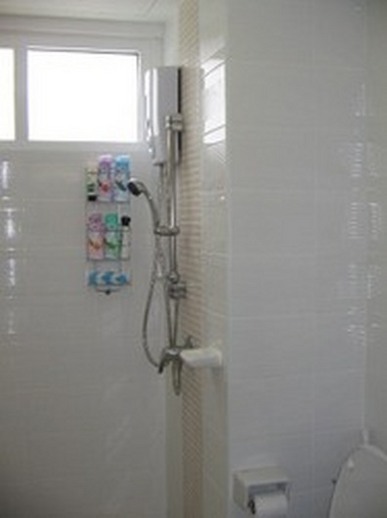 All of our apartments have been fitted with a state of the art hot shower unit complete with E.L.C.B. (Earth Leakage Circuit Breaker).